Background: Preeclampsia (PE) is a disorder of pregnancy characterised by persistent high blood pressure and proteinuria, which is usually detected after 20 weeks gestation. The pathophysiological mechanisms that underlie the pathogenesis of PE are unclear; although oxidative stress (OS), abnormal placental angiogenesis and endothelial dysfunction are reported to be contributing factors. Despite the synergistic roles OS and placental angiogenesis play in the pathogenesis of PE, very few studies have attempted to integrate both factors in the pathogenesis, diagnosis and treatment of PE. OS also influences placental angiogenesis through redox-sensitive transcription factors; hence understanding how OS influences placental angiogenesis may elucidate potential therapeutic targets for correcting abnormal placental angiogenesis and function in PE. Objective: This article aims to present an insight into the role of OS and angiogenic growth mediators (AGMs) in the pathogenesis of PE. 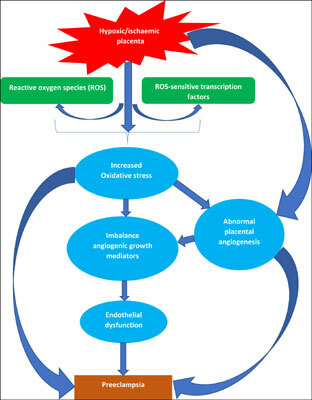 It also provides evidence supporting the fact that OS may directly or indirectly influence placental angiogenesis changes in PE through the expression of a number of reactive oxygen species (ROS)-sensitive transcription factors. Additionally, it covers mainly diagnostic biomarkers of OS and AGMs along with existing biomarkers and treatment options currently available for PE. Conclusion: Understanding the dynamics of preeclampsia will create a window of opportunity for predictive, preventive and personalised medicine (PPPM). Angiogenesis, biomarkers, oxidative stress, pathogenesis, preeclampsia, therapeutics.